The very first Robert E. Howard Days (or should I say "day"?) 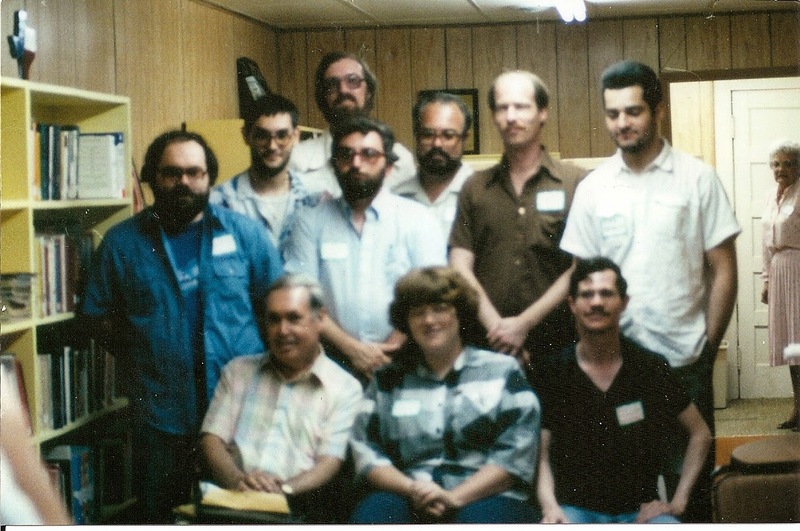 happened June 13th, 1986, when the ten intrepid souls shown above journeyed to Cross Plains, Texas to show their respect for the One and Only Robert E. Howard. We gathered at the behest of Rusty Burke, who had gone to Cross Plains the year earlier with Vern Clark - Rusty seemed to think that something should be done to honor Ol' Two-Gun in his home town and By Crom! - he was correct! The people of Cross Plains, headed up by Billie Ruth Loving and Joan McCowan, welcomed us with open arms and much curiosity. Why would folks come from all over the world to view the (then) ramshackle home of some obscure writer for pulp magazines of the 1930's? On the other hand, we ten all felt like we had gone to Mecca to trod the same soil as one of our heroes! It was a magical, life-changing trip for me; I wrote about it in one of my early REHupa zines and in turn that became a Cimmerian essay, How Robert E. Howard Save My Life. In the ensuing 28 years I've had many a wonderful moment while attending Howard Days, but nothing will ever capture the excitement and wonderful memories of The First Howard Days. The cast above: Seated l-r: Glenn Lord, Nancy A. Collins, Bill Fulwiler. Middle four l-r: Vern Clark, Bill Cavalier, Mark Kimes, Tom Kovacs. Back three l-r: Steve Ghilardi, Rusty Burke, Graeme Flanagan.